Apple to launch iOS 5 and iCloud today | What Hi-Fi? Apple is due to release the latest version of its operating system for iPhones, iPads and the iPod Touch, iOS 5, later today along with its new iCloud service. It has already released an upgrade to v10.5 for iTunes, to make it compatibile with iCloud. iOS 5 has more than 200 new features, according to Apple. It's compatible with the iPhone 3G S, iPhone 4, iPhone 4S (being launched on Friday), iPad 1 and 2, and the 3rd and 4th generation iPod Touch. Owners of iOS 5 devices will be able to sync them wirelessly to a Mac or PC over a shared wi-fi network, so you'll no longer need a wired connection to a computer. And every time you connect any iDevice to the mains, it will automatically back up any new content to iTunes. Users will be able to seamlessly share documents, emails and photos between devices, including Apple's Mac computers and laptops. • AirPlay video mirroring: wirelessly stream video on your iPad 2 or iPhone 4S to your HD TV via Apple TV. • Notfication Centre: just swipe down from the top of the screen to see new emails, texts, friend requests and so on. They won't interrup what you're doing. • iMessage: send unlimited text messages via wi-fi or 3G from your iPhone, iPad or iPod Touch to anyone else with a similar device. You can send text, photos, videos, locations and contacts. 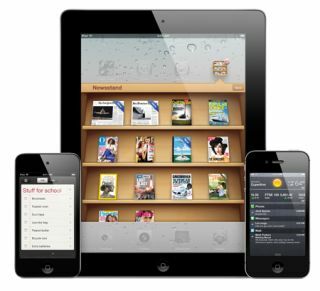 • Newsstand: just like iBooks, this will organise all your magazine and newspaper app subscriptions in one place. They'll appear on the Newsstand shelves. • Better integration of Twitter: iOS 5 makes it even easier to tweet from your iDevice. Sign in once in Settings, then you can Tweet directly from Safari, Photos, Camera, YouTube and Maps. • New camera app: allows you to open the app straight from the lock screen by tapping the camera icon. • Photo enhancements: crop, rotate, enhance and remove red-eye without leaving the Photos app. But by far the biggest upgrade is the inclusion of iCloud. This enables you to store your music, photos, documents and more 'in the cloud', and wirelessly pushes content to all your Apple devices. So you can access your content on whatever device your using, be it a Mac, PC or an Apple portable/phone. Sign up for iCloud and you'll get 5GB of storage for free, and you can pay for more if you need it. There's more about iOS 5 and iCloud in our coverage of the launch in America earlier this year. Click here and here for more info.